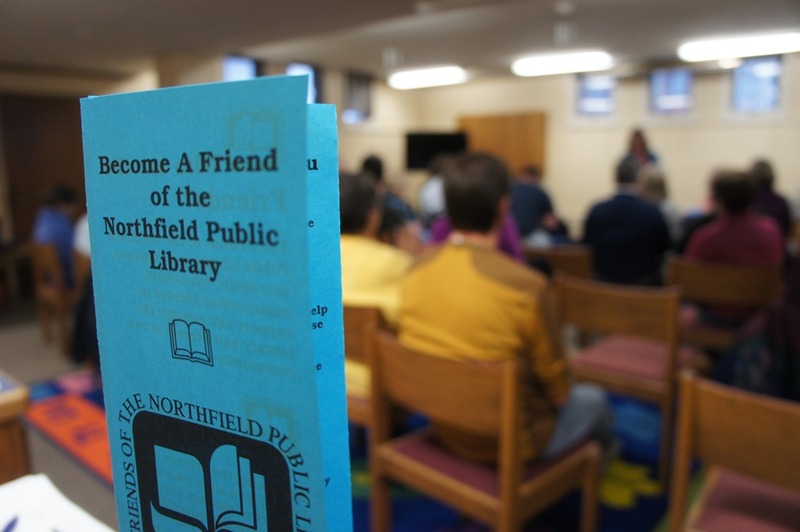 The Friends of the Northfield Public Library held their annual meeting on Tuesday night. Where? 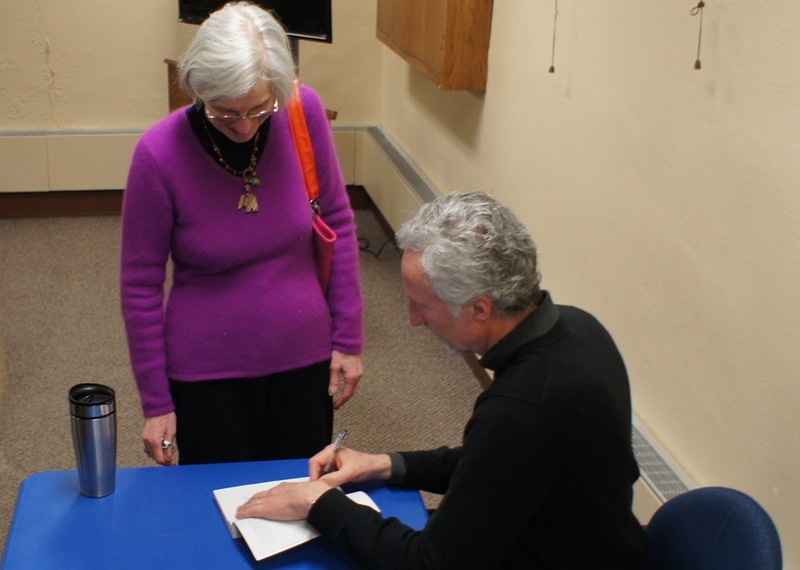 At the Northfield Public Library. 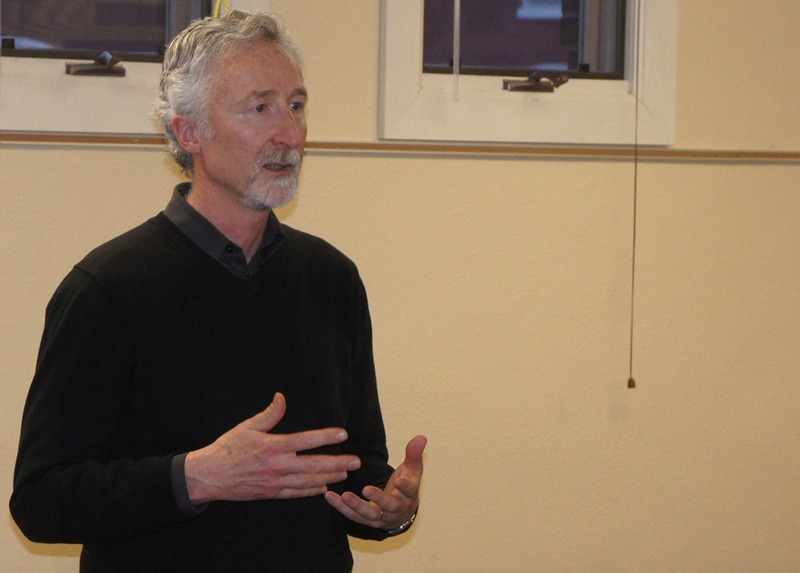 There were evidently some tense negotiations on Monday about the fee that the organization would have to pay for use of the library’s meeting room. 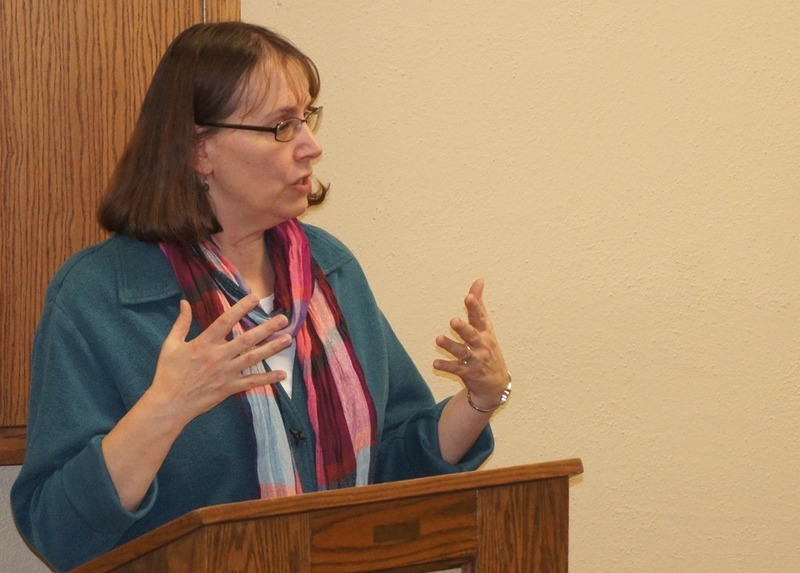 With the library’s recent budget cutbacks, Director Lynne Young is on the lookout for additional sources of revenue and has reportedly become a tough negotiator over non-profit use of that space. Friends president Bill North and treasurer Kathy Sommers ripped on Young during their presentations but she placed responsibility for the Library’s financial predicament on the City Council, as well as on library patrons like Will Healy who have hundreds of dollars of unpaid library fines for overdue books. 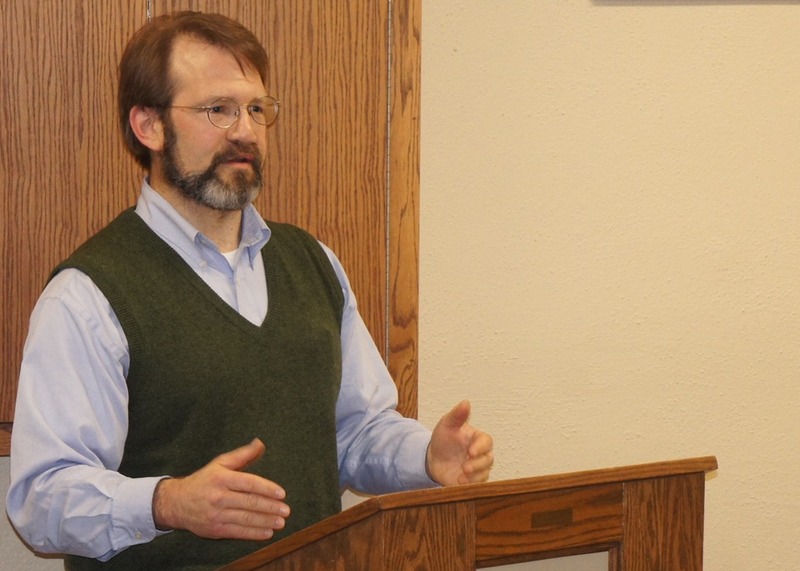 The rhetoric was getting pretty heated but thankfully, Northfield psychiatrist and author Dr. Henry Emmons was on hand to, um, calm things down. 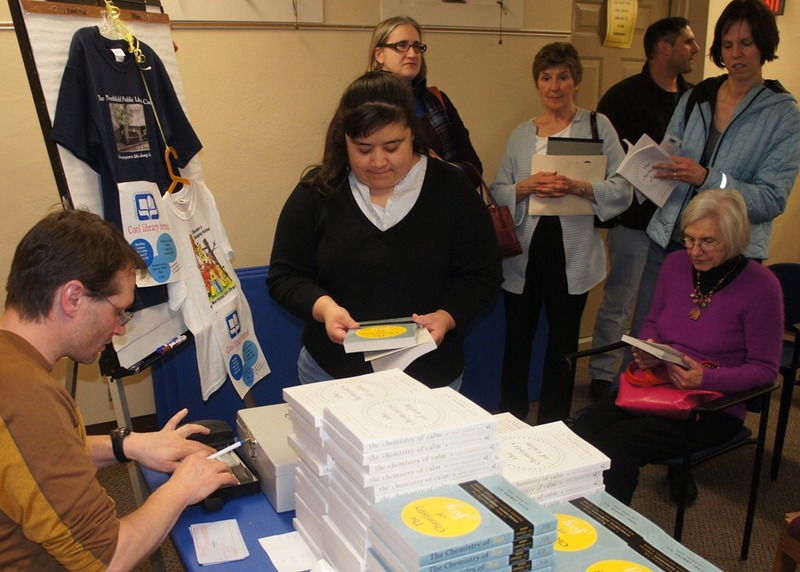 Henry was the featured presenter, speaking about his new book, The Chemistry of Calm: A Powerful, Drug-Free Plan to Quiet Your Fears and Overcome Your Anxiety. All went well until after Henry’s speech when Lynne Young noticed Monkey See Monkey Read bookstore proprietor Jerry Bilek selling copies of Henry’s book. 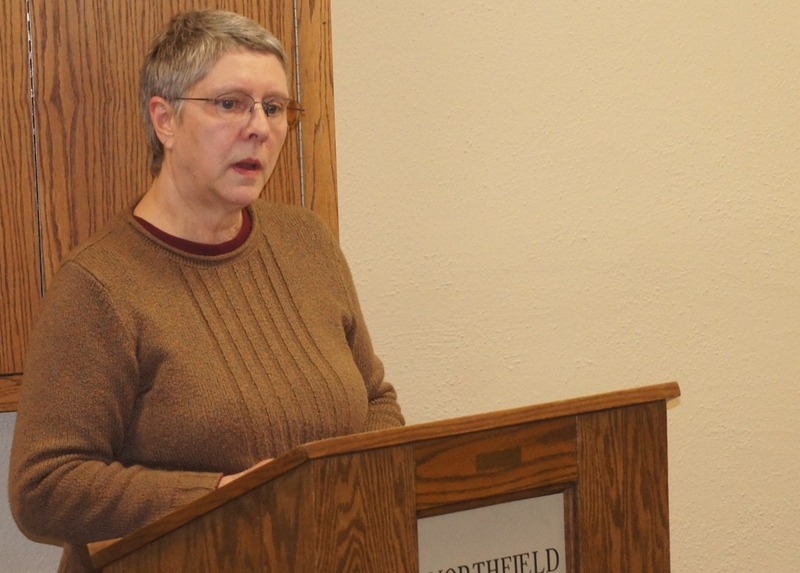 She argued that the Library should get a commission on all books sold on the premises. Jerry told her to stick it in her bookdrop. Henry refused to moderate the dispute unless someone agree to pay him his usual counseling fee. The crowd was getting riled up, and when someone mentioned Zamboni tires, I decided it was time for me to leave. Humorous? – not so much. Accurate? – not at all. You suckered me in. I was starting to get all riled, til I got toward the end and it went over the top! griff: you’ll probably just say I am being negative, but this is in incredibly poor taste, IMO. You have taken real people, at a real event, and put words and actions to them that they would not do, and which characterize them in a way you seem to think is humorous. What is the point? Why do you wish to denigrate these people in this way? Kiffi/Margit, I probably did miss the humor mark on this post. My problem is that while I enjoy attending and taking photos of annual meeting events like this, I don’t enjoy straight-forward reporting about them. And since I’d already done one annual event blog post earlier in the week, I just had the urge to do something goofy with this one. I know and like Lynne, Jerry, Henry and Will well enough to tease them publicly. But I’ll check with them to see if they felt denigrated, which wasn’t my intent. no worries here. for the record, I send a portion of the sales to the friends of the Northfield public library. Henry’s talk was great. Thanks, Jerry. And good to know about your donation! FYI, I captured the audio of Henry’s presentation and will blog it as soon as I edit out the crowd chatter at the beginning and end. In case anyone is wondering why I included Will Healy in my blog post (since he was not at the meeting), there was a hilarious Over and Back performance many years ago which included a spoof video. Will was a bit of an outlaw… tearing ‘do not remove under penalty of law’ tags off a mattress, straying outside a pedestrian crosswalk, and of course, not paying his library fines. Early this morning, I sent this privately to Griff. He responded that he would like me to post the following here, so that he may respond in a more public forum. Please remember, that I have a tremendous amount of respect for Griff, but often, I do not understand either his humor, or his intentions. This letter to him was meant as a way to get more information on what is focus and goals of running Locally Grown are. I struggle with publishing this, as I really wish it to remain private, but he requested that I post it here… so here goes. I respect you a lot, so I decided to e-mail this to you instead of posting it publicly, as a response to the Library post. I hope that this is taken the right way, as constructive comments. It is NOT meant as a personal attack. Faux news is a very dangerous thing Mr. Wigley… If not interpreted correctly by its reader, it can reflect negatively on the citizen journalist reporting it. I know you struggle daily with the battle as a Blogger / Citizen Journalist. However, at times, I struggle with the content on your site. I wish you all the success in the world, as you strive to be thought of as a “trusted news source” and be provided the same perks, access, and sources by the city and other organizations… then something like this comes out. I know in my heart that this was an attempt at humor, but viewed in a different light, it is a story of pure untruths and libelous statements, which at its core, goes against the standards of journalism. By publishing these, you lower your own journalistic standards, and your credibility as a news outlet. Griff, it is a tough call. I very much respect you, and respect what you are trying to do. I want you to succeed. Some of the things you do are quite funny… but this one missed the mark. I would rather you be thought of as a trusted news source, than “that crazy blogger.” Your too mature for kids stuff. I guess what I am saying is that, Do you want LGN to be a news site, or one of just pure opinion, attempts at humor, and personal commentary? I guess if I understand that it is the later, and the fight to be a news source has been dropped, then I can adjust my viewpoint as well. Keep fighting the good fight sir… Truly, I am on your side. I often get referred to by Norm at the Cow as “John, Griff’s friend that posts on Locally Grown.” In my opinion, that is a great thing. I really am proud to be referred to like that. However, every once in a while, we all step in it. We just need to be contemplative, reflect, adjust if needed, and move on. I just wanted to show that perhaps, there was an alternate opinion of your actions out there, that you might not be seeing. I hope after this we still remain friendly, and can continue to have a pint or coffee the next time we meet. Good Luck, and God Bless… KEEP GOING! Again, I respect Griff a lot, but even after 10+ years of knowing him, I still do not understand some of his humor or intentions. I am very much hoping for a response, that gives clarification as to his goals with LGN, and his role as a blogger / citizen journalist. Again, not meant as an attack, purely as a clarification, and providing him with an alternative viewpoint to his posts. Thanks Griff. Looking forward to your response. John, thanks for the feedback and being willing to discuss it publicly. * delivering it all in a way that’s fun and at times irreverent. That keeps it interesting for us and hopefully for our site visitors, as we believe civic engagement should have hefty and regular doses of fun. Speaking only for me, and not Ross and Tracy, I don’t see LoGro as a trusted news source in the traditional sense. I don’t have the time or inclination to be a reporter. But I do see LoGro as a trusted place for discussion of local issues, and I take that mission very seriously. I don’t think my fluff or faux posts detract from the serious discussions because the blog posts are separate items. People sometimes get fooled by the faux news pieces, which of course, makes my day. In most cases, there’s no harm done, and the truth about the piece quickly emerges in the attached comments. To prevent problems with search engines, I’ve learned to use ‘real sounding’ but fake names for people in the faux pieces when I make up quotes for them, eg, ‘Roscoe Curry’ instead of Ross Currier in this faux piece. I don’t include their photos for the same reason. In retrospect, I think the problem with this faux piece about the library is that I strayed from my guidelines. While I didn’t create fake quotes, I did use real photos of people with their real names. How did that happen? As I created the piece, I wasn’t thinking ‘faux.’ It was going to be a straight-up ‘photos of the event’ piece like the one earlier in the week about the Arts Town meeting. But somewhere in the process, my brain shifted to ‘faux’ and the ideas started popping. I pulled the trigger without thinking it through. I’ve checked with Lynne, Will, Jerry, and Henry and none were offended by the piece. Lynne reported, however, that she did hear from several people who didn’t get that it was a joke, so she’s had to do some legwork to assure people that the relationship between the library and the Friends of the Library is indeed a good one. All of this could be avoided if I had a separate blog that was all-faux, all the time, like The Onion. But I think as long as I stick to my guidelines, I can mix the real with the faux and not cause too many problems. All is well Griff. Thanks for the response and clarification. That is exactly what was needed. I can’t say I know many of the folks in this post other than by name and through observation from having grown up here, but my “uninformed” opinion was that I enjoyed this post. A library meeting gone awry strikes me as clever and never would I have thought this to be libelous (which, it seems to me, is a rather extreme interpretation) particularly when the story is labeled as Faux News. As we’re all well aware, humor is incredibly subjective and interpretation is everything. I appreciate the faux news – even when I, too, get sucked in before checking the label. I have no problem differentiating Griff’s attempts at humor from his reporting and discussing issues in Northfield, but that’s just my opinion… again, not really knowing anyone involved, just looking in from the outside as a faithful LoGroNo reader and highly occasional participant. GRiff, I may not be part of the larger group opinion here, and I have grown quite used to that circumstance! hahaha! The zamboni ending and the Will Healy thing had e splittin my sides! And I am a member of his church! You’ve got me a couple times here with faux news, as you know, and I have gone on mad hatters wild ride on one or two. When however I found out you were playing, I had to laugh at myself too! Not my place to tell someone not to be put off by anothers sense of humor, or mine. Different stokes for different folks.